The Austrian Josef Benetseder wins his second Crocodile Trophy stage today into Hope Vale. The wide and open Outback Highways suit the European road racing pro and he crosses the line in 3:59:50 with a gap of almost six minutes to the main field, which arrives in big bunches and several finish sprints decide the final placings. Mark Frendo from Australia still leads the race by almost 12 minutes ahead of Cory Wallace (CAN) and Jiri Krivanek (CZE). Second in elite today goes to last year’s fastest Australian Steve Rankine from Cape York (AUS) ahead of Jiri Krivanek (CZE). Liesbeth Hessens finishes today’s race only one and a half hours behind the stage winner and Maria Cristina Prati (ITA) races strongly, increasing her lead in the general women’s classification to 18 minutes against fellow Italian racer Giordana Sordi ahead of tomorrow’s final stage into Cooktown. 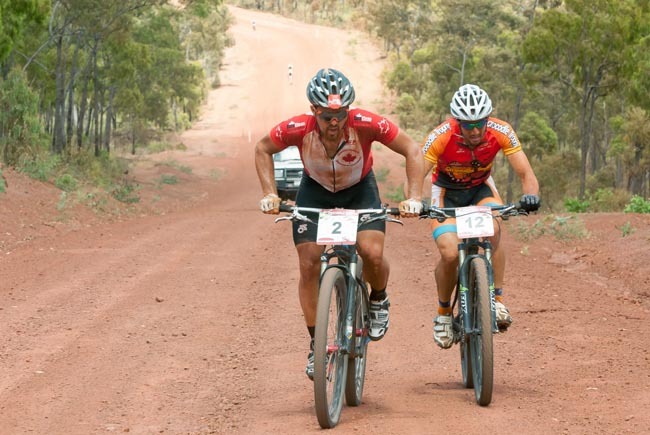 The second-last stage of the 19th Crocodile Trophy lead riders out from the sleepy town of Laura onto Battle Camp Road into the Lakefield National Park and the scenery was dominated by the iconic Australian Outback landscape – wide and deep-red gravel highways under bright-blue skies. 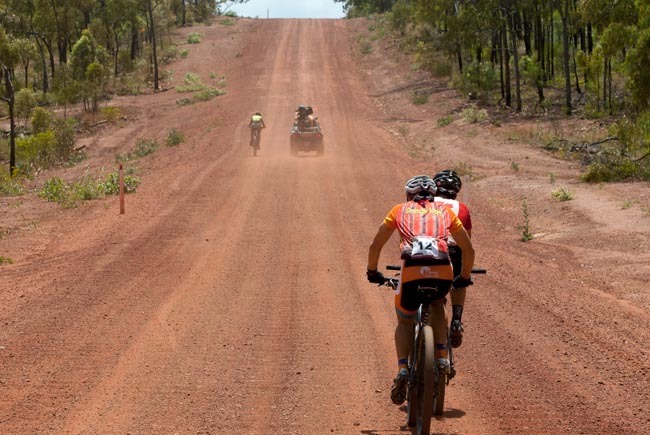 Kangaroos, lizards and all kinds of birds accompanied the riders as they were racing in radiating heat towards the coast and the Aboriginal town of Hope Vale. Several river crossings provided a welcome cool spray of water and the terrain kept changing from rough and corrugated gravel roads to recently upgraded asphalt highways. “I have to admit that I had my eyes on this stage right from the start in Cairns”, admitted the victorious Austrian at the finish line. “I knew that after the second feed zone there would be some steep climbs and I used my chance to attack”, he explained his race tactics, which had him win his second stage and not coincidently on his home country’s National Day. “Today is a special day in Austria, we celebrate our National Day. "That was a big motivation for me – two years ago I lost a stage win in the finish corner on that day. I had some unfinished business at the Croc, but now I’ve got the stage win back”, said an emotional Benetseder. Cory Wallace, one of the main favourites and currently second in the elite category behind the Australian Mark Frendo was disappointed with his race today, “I tried to chase Josef [Benetseder], but no one would work with me. Mark [Frendo] was obviously just keeping me at bay, but with today’s head wind I didn’t stand a chance keeping up with a road pro on my own.” He explained that a breakaway group of four had formed, which saw Benetseder escape – Wallace, Frendo and the Czech rider Jiri Krivanek couldn’t keep up with the fast pace and eventually let themselves fall back to the next bigger chaser group. With a gap of almost 12 minutes to Cory Wallace, Mark Frendo for the first time showed some excitement. “My main fear now is a mechanical, I’ll be very careful tomorrow to keep it all together until Grassy Hill”, the humble U19 and U23 National MTB Champion said at the finish. The now 28-year old had just gotten back into racing and plans to compete in more stage races in future. “I raced with Cory at the Mongolia Challenge earlier in the year and got a good idea of what level of endurance it takes to have a chance to beat Cory. I trained hard and went into this race with confidence that I could doi it.” Frendo’s victory tomorrow would be the first Crocodile Trophy win since fellow Australian Adam Hansen’s double-victories in 2004 and 2005. The estimated arrival for the Crocodile Trophy racers tomorrow in Cooktown is from 10.30am. They will have completed their last stage, which is a 50km leg with sandy terrain and river crossings from Hope Vale through Endeabour River National Park. The final challenge will be the 30% climb up to Grassy Hill, which mark’s Captain Cook’s landing spot in Australia almost 250 years ago.